Our Seapoint Rocks was our first creation when I bought the company in 2012. This idea was inspired by the love and connection that we all seem to have to these amazing gems of nature. Whether it is on a beach, in the mountains, while meditating or skipping them across a lake we all have a connection to rocks. It just seemed like a great idea and to this day they are one of the top favorite creations we have made in the company! Our 100% beeswax handmade sustainable Seapoint Rocks make the perfect gift for that person who has everything. What a great conversation piece to bring as a hostess/host gift too! One of my favorite uses for the Seapoint Rocks is to light one while meditating to the morning sun. It is a great way to start the day. 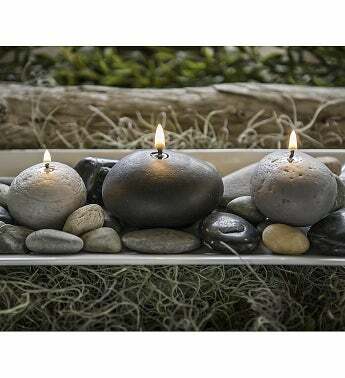 Our Seapoint Rocks come in a set of three with a small, medium and large rock. The burn time is approximately 8-10 hours in total. We know you will enjoy these beautiful candles! These original-design candles resemble the round smooth beach rocks we find when beach combing along the New England coast. Enjoy the coast of Maine in pure beeswax. Our Seapoint Rocks come in a set of three with a small, medium and large rock. The burn time is approximately 8-10 hours in total.